It's December, and many are doing their holiday shopping or making a wish list of gifts they'd like to receive. During the Future Ground Combat Vehicle Summit in Livonia, MI, earlier this month, Army acquisition professionals and program managers had their own wish lists that included an assortment of robots and ground combat vehicles meant to protect Soldiers and give pause to potential adversaries. Brian McVeigh, project manager for Force Protection, was big on robots. Over 7,000 were fielded in just the last decade, he noted. The challenge now is to move the most effective ones into programs of record. Among these, he said, is the M-160 Robotic Mine Flail, which efficiently clears land mines using rotating chains that flail the ground. It is also rugged enough to be protected against mine explosion fragments. The M-160 made it into a program of record this year before the holidays, and a number are already involved in route-clearance missions in Afghanistan. 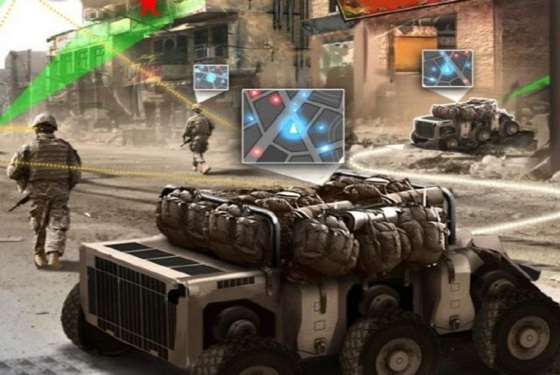 By 2025, dismounted Soldiers will conduct foot patrols alongside robots called Squad Multipurpose Equipment Transport (SMET) vehicles that carry rucksacks and other equipment that will lighten the Soldier load, McVeigh said. In order to get these to the warfighter sooner rather than later, the Army is procuring them through an Other Transactional Agreement, or OTA, he said. The OTA got the program rolling fast, with requirements out in April and a down-select six months later in November, he said. Four contracts were awarded for 20 vehicles each, which will be tested by Soldiers in two brigades until the end of next year. Low-rate initial production is expected to follow with a production contract in place. The requirements were limited to give manufacturers more flexibility in the trade space, he said. The only firm requirements were that SMET be able to haul 1,000 lb off-road, cover 60 miles in 72 hr, and cost $100,000 or less each. The OTA was used because Army leaders prioritized getting the weight off the backs of dismounted Soldiers, he noted. Common Robotic System [Heavy] (CRS-H) is designed to disarm or disable unexploded ordnance using a highly dexterous arm remotely controlled by a Soldier. The Army just published requests for information from industry for the wireless-range manipulator arm, McVeigh said. Feedback from industry on CRS-H has been good, he said. It is expected that by next summer, draft performance specifications will be issued, and it is hoped that fielding can begin as early as 2020. This system is also going the OTA route. The Enhanced Robotics Payload is another explosives ordnance disposal robot. A request for proposal has been released, McVeigh said. And in October, a contract was awarded to Endeavor Robotics for another EOD robot, the Man-Transportable Robotics System Increment II. David Dopp, program manager for Mobile Protected Firepower Vehicle (MPF), Ground Combat Systems, said a request for proposal was released in late November for MPF. The MPF he envisions can be described as a light tank. It will be light in the sense that it will weigh less than half as much as an Abrams tank, which will allow two to fit inside a C-17 aircraft. That means its armor will be less than an Abrams. The MPF will also sport a gun in the 105-mm to 120-mm range, similar to the ones on early versions of the Abrams, Dopp said. It is expected that the MPF will provide infantry brigade combat teams with a long-range, direct-fire capability for forcible entry and breaching operations, he noted, so it is not by any stretch a tank replacement. There will not be a lot of requirements other than MPF being light and powerful, he said. Army leaders are eager to quickly get it into the hands of Soldiers for testing. A contract could be awarded by early FY19, with low-rate initial production to follow, he said. The likelihood is high that the Army won't get to pick the time and place of its choosing for the next battle, said Gen. Robert Abrams. But it's likely that the next battle will take place in a megacity, said Abrams, commander of U.S. Army Forces Command. "The chance of fighting in a megacity is going to go through the roof," he said, pointing out that there are currently 25 megacities across the world. A megacity is defined as a city of 25 million or more inhabitants. By 2035, the number of megacities is projected to double. 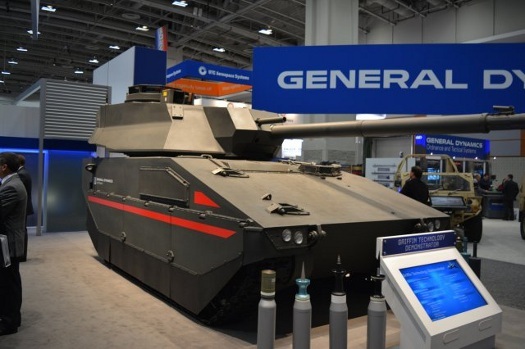 Coincidentally, 2035 is also the target delivery date for what is currently the Army's conceptual Next Generation Combat Vehicle, or NGCV, he said. Recent fighting in countries throughout the Middle East validates the value of combat vehicles in urban areas, but also reveals vulnerabilities, Abrams said. The NGCV will address such shortfalls. Dense, urban terrain diminishes the effectiveness of fighting vehicles, which are impacted by obstacles, large civilian populations, and confined spaces, he noted. In such confined spaces, enemy dismounts are better able to isolate individual vehicles at close range and employ anti-armor fire and IEDs of all types. In light of those difficulties, requirements for NGCVs will include enhancements to optimize performance in urban environments, he stressed. Another key consideration in the design of the NGCV is that the vehicle must contribute to a reduced logistics tail, or supply line, Abrams said. Reducing the logistics tail will enable the maneuver force to move more quickly and with greater agility. The general offered several ways this could be accomplished. If the NGCV were to employ hybrid energy systems, for instance, that could reduce the need for fuel resupply convoys. Other ways to reduce sustainment requirements include such things as speed diagnostics that support field maintenance and component ruggedness and life extension, he said. "That's an aggressive list," Abrams said. "And, it is unlikely all of these can be built into the Next Generation Combat Vehicle in that timeline. But that's OK."
What's important, he said, is that those items signal a green light from the Army to industry to deliver the most capable system that can be produced with existing technology, anchored in doctrine. Another challenge, he pointed out, is balancing the age-old tradeoff of survivability with weight, agility, and lethality. "Ideally, we would be able to trade weight for protection other than armor," he said, explaining that will require advances in material science, along with innovations in active and passive defenses. Whatever the outcome, the end product must be able to dominate peer enemies that have fielded their own version of a next-generation vehicle, he said. 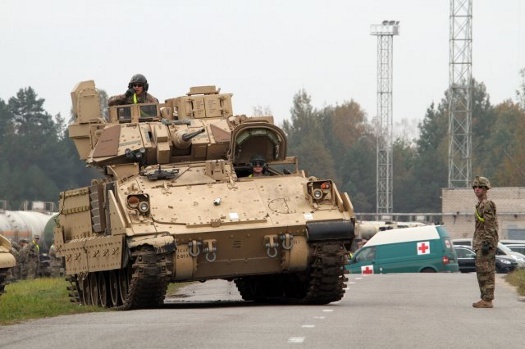 Maj. Gen. John Charlton, commander, Army Test and Evaluation Command, said that although the Next Generation Combat Vehicle fielding isn't expected until 2035, a lot of the components that may find their way onto the NGCV in one shape or another are being currently tested around the Army. Two such systems that will likely inform development of NGCV, he said, are the Common Remotely Operated Weapon Station-Javelin and the Stryker Remote Weapons Station. CROWS-J allows the warfighter to remotely engage targets with precision fire from the Javelin while on the move, he said. Stryker RWS is a 30-mm cannon on an unmanned turret. Both systems keep the gunner inside the vehicle, in a less exposed area than the turret. Electromagnetic interference testing is now underway on the sensors and software, he said. There are some challenges to overcome in putting this technology on the NGCV, he said, describing a few. Although the gunner is tucked inside the vehicle, rounds must still be loaded and reloaded in the gun, which means being exposed to enemy fire and working in cramped conditions, he said. Getting everything working correctly will require a lot of software development, he said. This is probably the most difficult challenge. And finally, situational awareness could be lost with the crew fully buttoned up inside the vehicle, he said. This could be particularly bad in urban terrain where Soldiers cannot get good visuals of what's around and above them. The situational awareness issue could be addressed through adding sensors and cameras so the crew doesn't feel so completely closed in, he noted. Charlton said several promising weapons are in the science and technology and testing stages. Engineers are now designing extended-range cannons that can be mounted on the Paladin and will fire much greater distances than current artillery, he said, noting that the distances are impressive but classified. The cannons could find their way on the NGCV, he said. The challenges are now designing a breech in the gun system that can handle the enormous pressures and getting the active protection systems (APS) software and sensors developed. Also, the crew might be adversely affected by the enormous pressures, so some sort of dampening mechanism would be needed. Another weapon that will eventually make its way to the battlefield is the high-energy laser, Charlton said. The Army and Air Force are now out at White Sands Missile Range in New Mexico using them to knock out air-to-ground and surface-to-air missiles, as well as unmanned aerial vehicles, he said. A 300-kW laser will be built and tested in the near future, he added. "We want to ensure the lanes are clear when firing the laser," he said. "We don't want to take out one of our own satellites, so it will need to be equipped with an avoidance detection system." Lastly, Charlton said that an electromagnetic rail gun will be developed soon, but he's not sure if it will find its way onto the NGCV. "But it will be on the battlefield in some shape or form," he said. 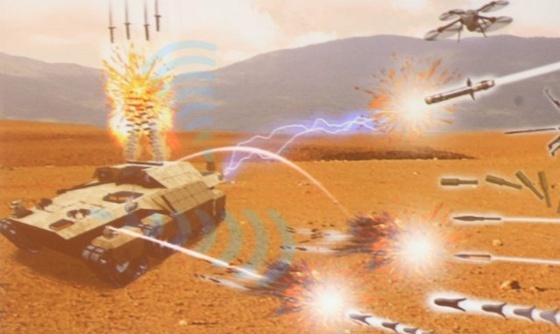 The rail gun will shoot small, dense projectiles to distances of 30 km at several times the speed of sound using electromagnetic pulses, he said. That will require some serious power, so initially it might have to be loaded on a large cargo truck. Dr. Dale Ormond, principal deputy, Research Directorate, Office of the Assistant Secretary of Defense for Research and Engineering, said his office is working to ensure all of the laboratories across the Department of Defense are talking to each other, helping each other, and avoiding duplication of effort. One area he's particularly excited about is artificial intelligence paired with autonomy. Machines programmed for artificial learning will be able to collaborate much better with Soldiers and give commanders more options on the battlefield, he said. Other promising areas are hypersonic weapons, he said, like the rail guns and lasers that the Army is working on. He said he also expects to see a lot of developments in the space and cyberspace domains, as well as being able to operate in GPS-denied environments.